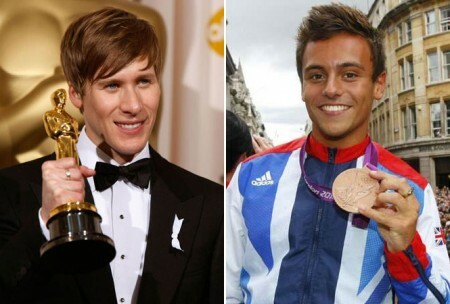 LONDON — British Olympic diver Tom Daley, who revealed publicly for the first time on Monday that he is in a relationship with another man, is dating LGBT activist and Oscar-winning filmmaker Dustin Lance Black, according to E! News, and confirmed by sources to LGBTQ Nation. The couple reportedly were introduced at the Soho hotel in London this summer, with Daley allegedly traveling back and forth to Los Angeles to visit Black since then. Their relationship will be chronicled in the Wednesday edition of The Sun, a U.K. newspaper, according to reporter Dan Wooton. Daley is 19, Black is 39. Daley said in a video posted to his YouTube channel on Monday that he’s been dating a man since spring, but did not identify who that man was. There was no comment from either Daley or a representative for Black, who is currently returning home from the Side by Side LGBT Film festival in St. Petersburg, Russia, which was held this past week. Black and film director Gus Van Sant had traveled to Russia to showcase their 2008 Oscar winning film ‘Milk,’ the bio-sketch of slain San Francisco Supervisor and LGBTQ icon, Harvey Milk.